More than 5,000 vehicles a day traverse two-lane Hardesty Road in Shawnee, Oklahoma. Art Muller, Citizen Potawatomi Nation Roads Department director, said his most recent traffic count for Hardesty between State Highway 177 and Brangus Road shows the need for repaving and widening. CPN has been working on this expansion, which runs alongside many of its enterprises, since 2008. This summer, the Pottawatomie County Board of Commissioners approved the agreement between the county and the Tribe to create four lanes with a middle left-turn lane. The widening project will be in two phases. 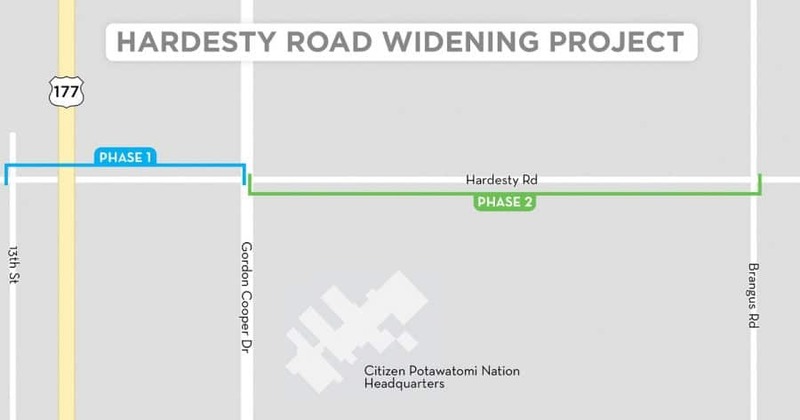 The first phase begins at Hardesty and 13th Street, located a quarter-mile west of State Highway 177, and ends at Gordon Cooper Drive – roughly 1.25 miles. The second phase picks up where phase one stopped, continuing another 2.5 miles to Brangus Road. In total, 4 miles of road will be repaved and three lanes will be added. Muller said phase one is more complex because a significant number of utilities must be relocated. Crews will begin relocating utilities in spring 2018. Once that is complete, paving begins and is projected to be done within the year. While construction begins on phase one, designs for phase two will be finalized before crews lay pavement in 2019. Shawnee residents and CPN tribal members and employees will drive on a four-lane Hardesty Road by 2020. Muller said he is excited about the long-term impact of the expansion. “It’s going to be a good project that will allow further future economic development in the (Tribal) complex area without creating traffic jams,” he said. The project should cost around $12 million to complete. While the first phase is roughly half the length of the second, they are comparable in allocated funds due to utility relocations. Pottawatomie County will fund paving the first quarter-mile of the Hardesty Road expansion from 13th Street to State Highway 177, and the rest of the project is funded with federal Tribal Transportation Program funds brought in by CPN. Annual TTP money funds the CPN Roads Department and those dollars must be used for roads projects within the tribal jurisdiction. 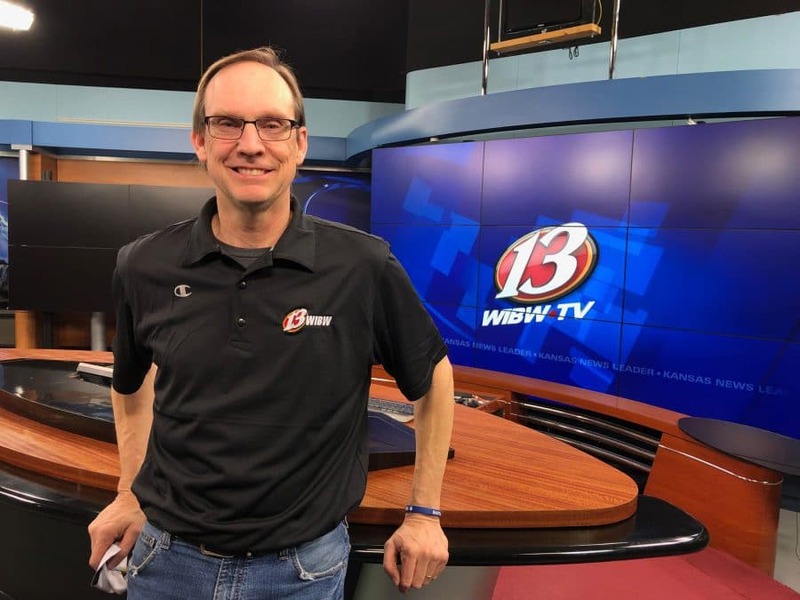 Muller talked about the strict regulations road construction projects must meet to be eligible for TTP money, including well-defined rights of way and public use. “The biggest one has been right of way because Hardesty Road is in city limits, maintained by the county and used by the tribe,” he said. It has taken nearly a decade for several government entities to approve the project, including the Pottawatomie County Board of Commissioners. Hardesty Road is within Pottawatomie County Commissioner Eddie Stackhouse’s district. “It (the county) vacated a section of Hardesty Road just recently,” Muller said. “That was one of the latter hurdles to get over before they signed the MOA (memorandum of agreement)” on Aug. 7. In recent years, the Citizen Potawatomi Nation Roads Department spent funds on adding parking by the softball fields, restoring a historic bridge and adding pedestrian sidewalks alongside Gordon Cooper Drive as well as around a nearby geothermal pond. When considering proposals for the department, Muller thinks about what’s to come for the larger area and the Tribe. Along with Hardesty Road, a southern frontage road at Grand Casino Hotel Resort as well as more parking at several Tribal enterprises are also being considered.